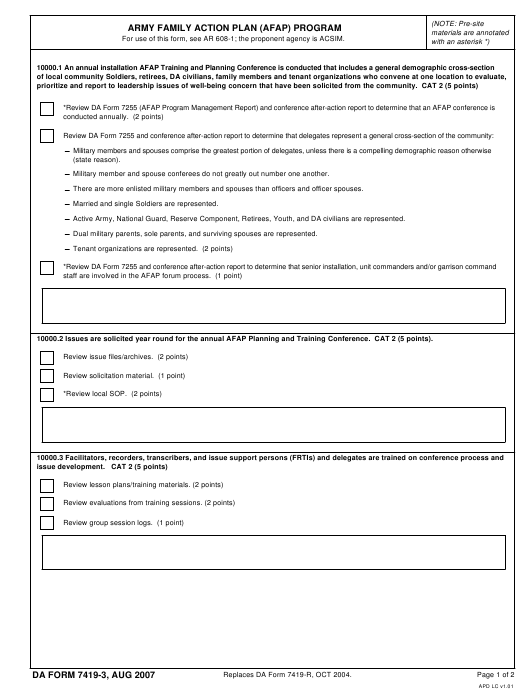 DA Form 7419-3 - also known as the "Army Family Action Plan (afap) Program" - is a United States Military form issued by the Department of the Army. The form - often mistakenly referred to as the DD form 7419-3 - was last revised on August 1, 2007. Download an up-to-date fillable PDF version of the DA 7419-3 down below or look it up on the Army Publishing Directorate website. Military member and spouse conferees do not greatly out number one another. There are more enlisted military members and spouses than officers and officer spouses. Married and single Soldiers are represented. Active Army, National Guard, Reserve Component, Retirees, Youth, and DA civilians are represented. Dual military parents, sole parents, and surviving spouses are represented. 10000.2 Issues are solicited year round for the annual AFAP Planning and Training Conference. CAT 2 (5 points). Replaces DA Form 7419-R, OCT 2004. 10000.6 An AFAP Conference Committee has been established to provide oversight of the local conference requirements.